Tropical Ornaments Boxed Holiday Cards are certain to capture your Holiday Greetings this year. From Great Papers Holiday Collection, these Boxed Christmas Cards offer joyful holiday image with a fun twist. Perfect for the beach lovers in your life! Along with the image is the simple saying "Greetings". These cards are paired with a nice white envelope featuring gold foil lining on the inside. These unique Holiday Cards are made from a quality 10Pt. Stock- Not Printer Compatible and measure 5.625" X 7.875" each. 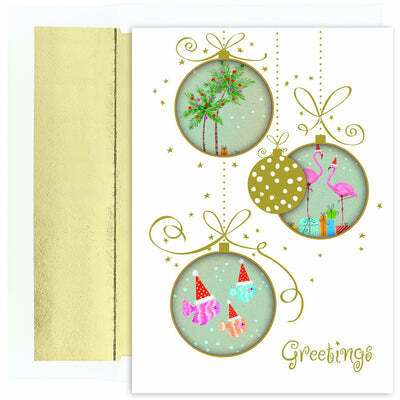 The inside of the greeting card contains a Holiday verse in gold reading "Warmest Wishes". Envelopes with gold foil are included.